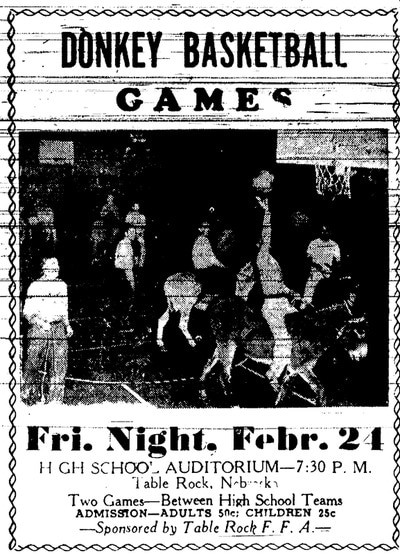 ​set in table rock? even better! after a hurricane -- "i alone am left"
Read stories that are poignant, or dramatic, or mysterious, or all of the above. 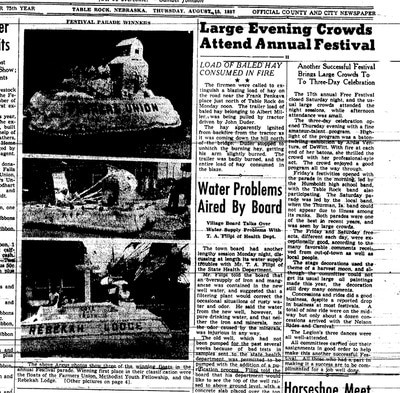 The influenza came to Pawnee County, and it hit Table Rock especially hard. 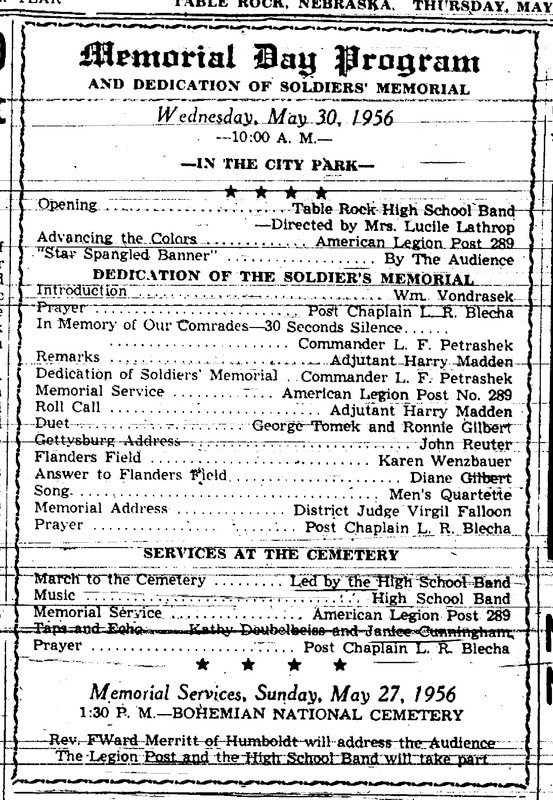 The Table Rock article includes the few photographs that could be found of those who died, usually from school pictures. Read about it. ​"in a strange and mysterious way." The August 16, 1878 Nebraska State Journal mentioned a conductor by the name of Charley Foote. It doesn't say that Charley Foote lived in Table Rock. 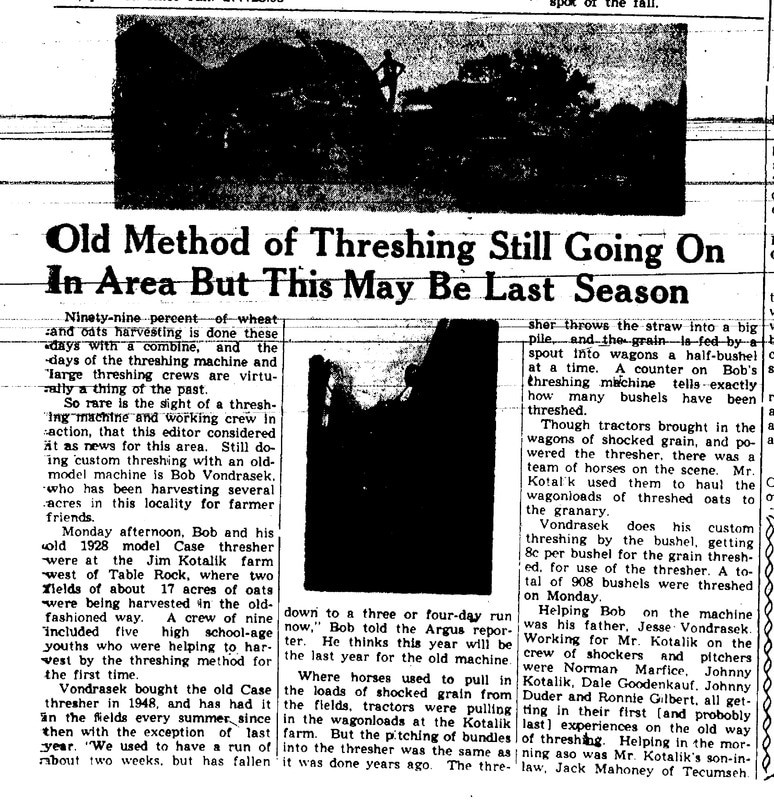 It just says that he "lost an uncle in a strange and mysterious manner near Table Rock." 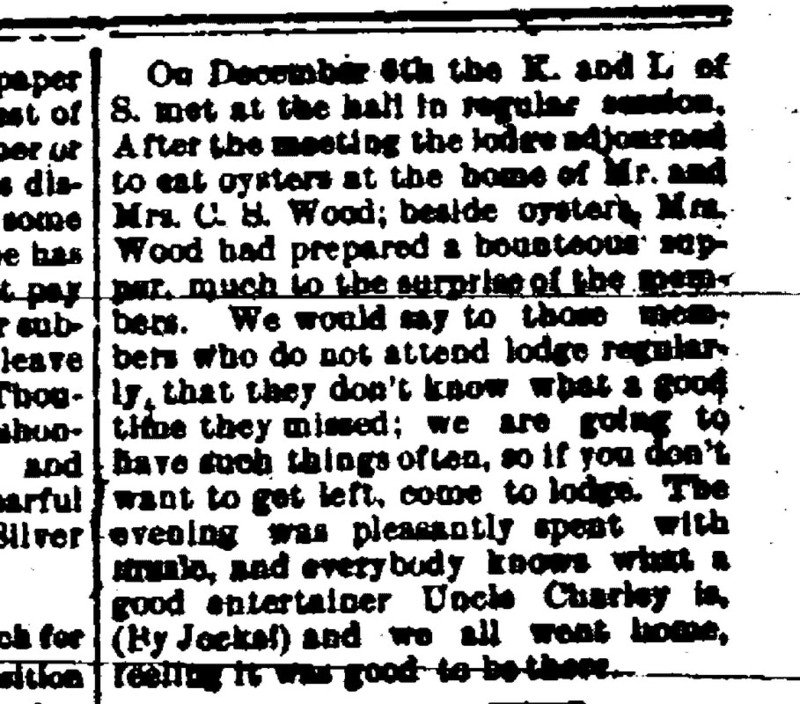 ​The December 19, 1878 Nebraska State Journal again gives that tagline: "Charley Foote, who lost an uncle in a sad and mysterious manner at Table Rock." 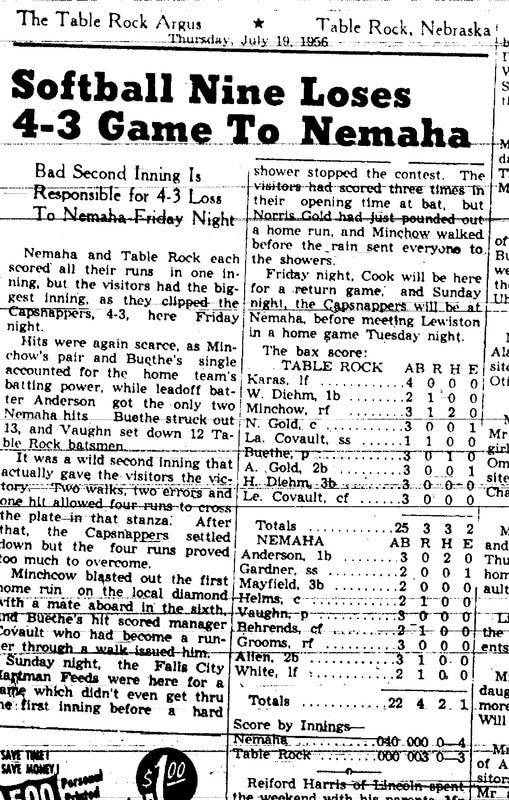 This time, the Charley Foote with the lost uncle showed up at the office of the Atchison Globe with beer. Who knows! 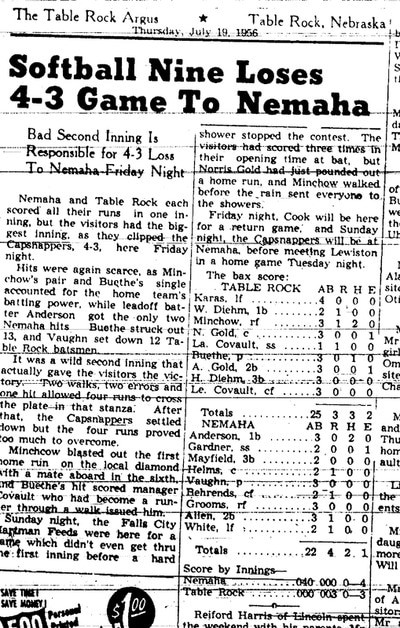 Only the Nebraska State Journal, judging from the distance of time. 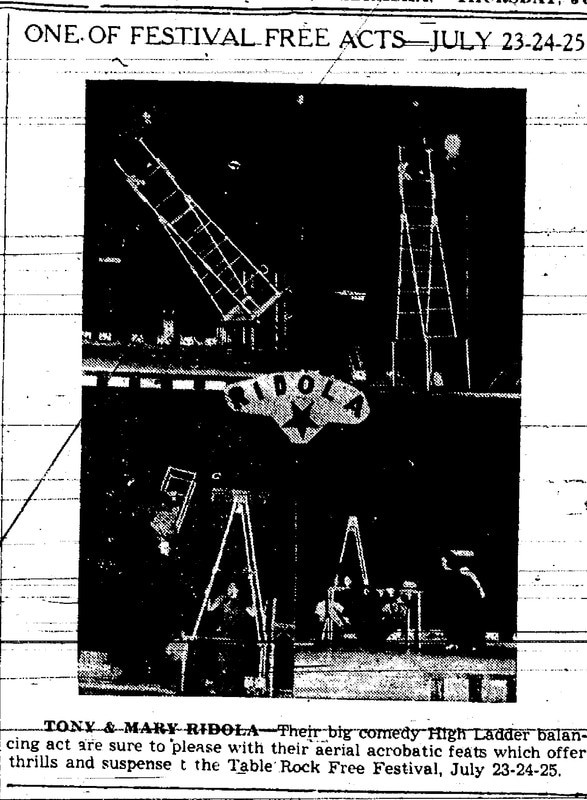 A search of deaths in Table Rock before August 1878 yields no obvious clue. Cosmus Snoke, an Old Soldier of the Civil War, died, but it was of old age. Is the description serious, or is this the punchline of a joke told about this Charley Foote? "Two railroad men walked into a bar,".... it could begin. Or did something sad and mysterious actually happen to an uncle? If so what happened????? If we only knew, we could judge for ourselves whether it was sad or whether it was mysterious. But all we know is that it was Charley Foote's uncle and something happened to him. Did this follow Charley Foote the rest of his life? In those days, when people presumably knew what had happened, is this something that the women talked about in hushed voices as they washed dishes following a church dinner? "Did you see Charley Foote here tonight?" asks one. "Oh yes. And he lost his uncle in a sad and mysterious manner," says another. "Near Table Rock," adds another. 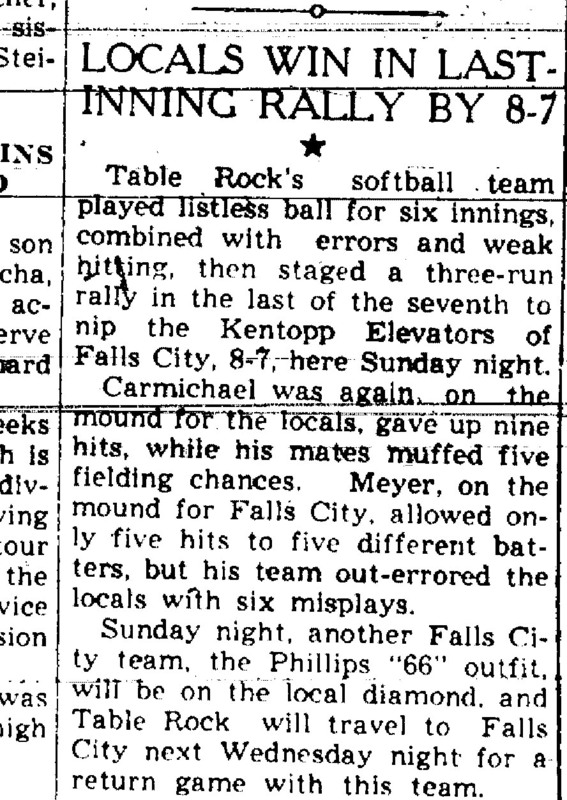 In those days when people presumably knew what happened, did Charley Foote walk into a tavern (not in Table Rock -- it was dry back then) and say, "Charley Foote, you old so and so! Is that uncle of yours still lost?" Wink wink. 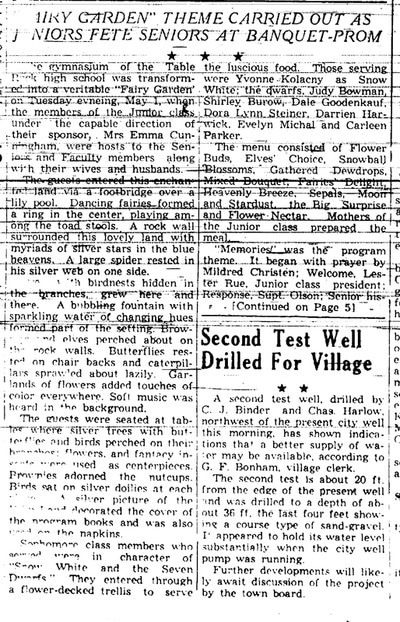 Did Charley Foote go to the Table Rock Cemetery and stand silently at the grave of an uncle and think of the manner in which the uncle had died....near Table Rock? 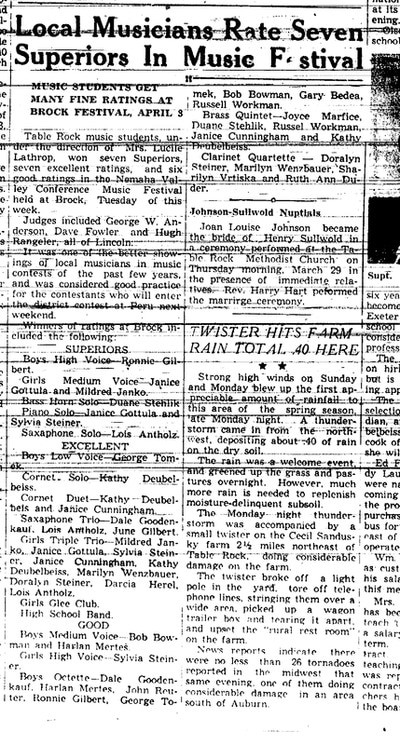 And yet, the Nebraska State Journal continued to mention Foote's uncle with no further information other than that he had died in a "sad and mysterious" way! What really happened? If anything? There's got to be a good story there! By the way, did Charley Foote exists? Apparently so, and apparently he was a conductor, and he was a popular man. 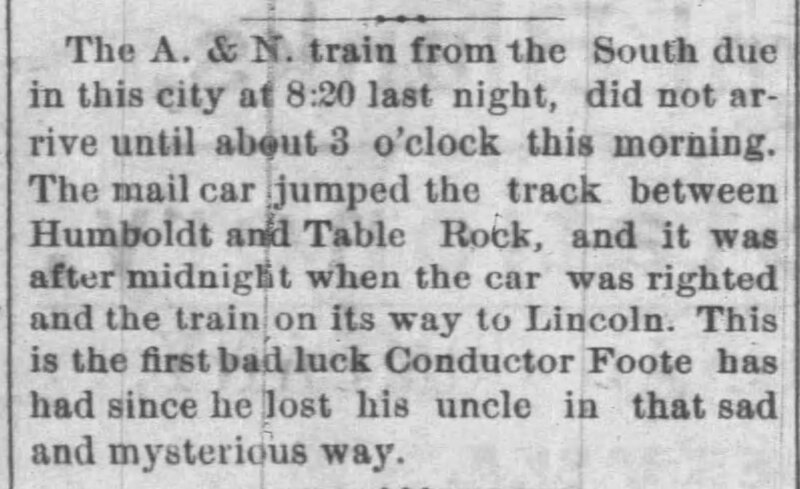 He had been mentioned by the Nebraska State Journal in an August 5, 1877 story about a train excursion the year before. "Conductor Foote had charge of the train and he did his job well, as he always does." On the eastern edge of the northwest quarter of the Table Rock Cemetery is an imposing stone. 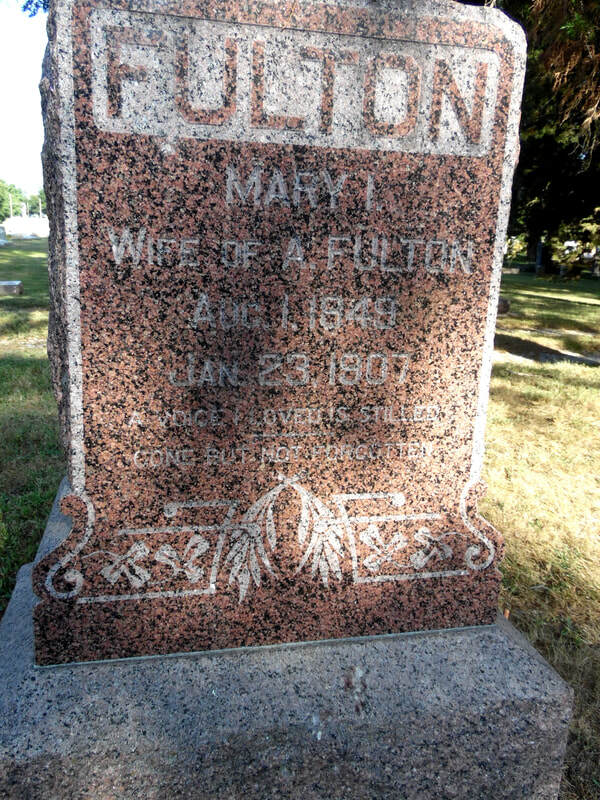 It marks the resting place of Mary Fulton. She died in 1907. Mary's husband Al had chosen an epitaph: "A voice I loved is stilled." I recently found the poem from which those poignant words were crafted. The change from a voice "we" loved is stilled is worth thinking of. Two children had been born to them in the early years of their marriage, but neither had survived their mother. Al was left alone. The words are even plaintive when you learn this: Al had heard Mary's voice his entire life. She had been born three weeks after him, on a neighboring farm. 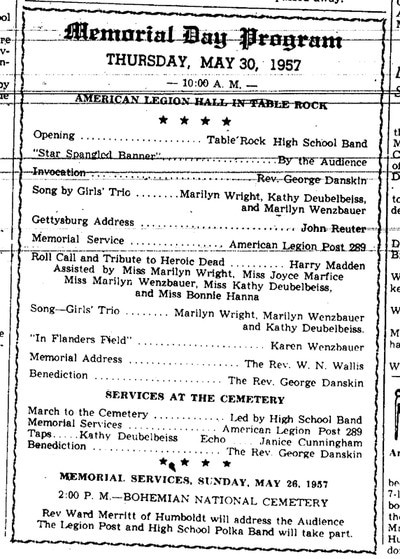 In Mary's obituary--for which Al would have provided the information -- it says that they were rocked together in the same cradle. Al served his country as a soldier in the Civil War, perhaps the only time in their lives that they were apart. After Mary died, he ended up in what they then called an"Old Soldier's Home," he having been at the one in Leavenworth. He died a decade after his beloved Mary. His siblings had either no money or no interest in putting up a stone, at least one that would endure for a century. He rests by Mary, which was probably all he wanted. The only other thing we know about Mary so far is that she taught at the District 51 country school in 1885. She taught for three months and was paid $40. She was 36 years old and married at that time. Her son Fred was about 16. It's interesting that a married woman would have taught at a country school in those days. Perhaps they were desperate. Al Fulton's grave is one of the several unmarked Civil War veterans' graves still to be marked with a military tombstone. The Historical Society will apply for it. This is one of the many projects for which money has and will be raised for the maintenance of the graves of the Civil War soldier buried in Table Rock. 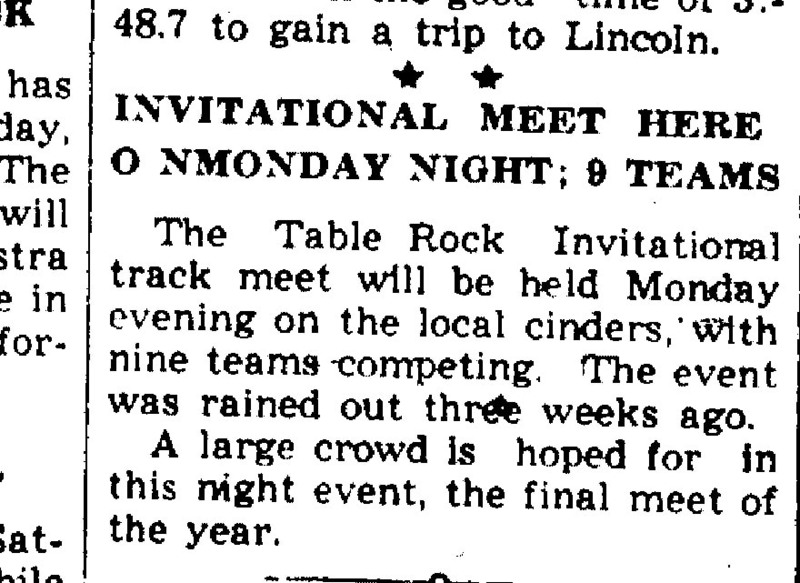 ​​Table Rock Argus, Jan. 24, 1907. Mrs. Mary I. Fulton died at her home in this city about 7:20 last evening after an illness dating back about 18 months, when she suffered a stroke of paralysis. In May last she suffered a second stroke, and a third stroke on the 4th of this month when she was home alone, and she was found unconscious lying partly on the bed after the door of the house had been broken open; from this attack she never recovered, but remained in an unconscious condition until her death. Mary I. Baughman was born in Medina county Ohio, August 1, 1849; when a child she moved with her parents to Indiana, later going to Illinois; she was united in marriage to Al Fulton (who was a baby with her back in the Ohio home and they had been rocked together in the same cradle) at Springfield, Ill. In 1869; two children were born to this union, one dying in childhood, and the other, Fred dying at the age of 33. They came to Nebraska in 1879, locating at Tecumseh, coming to Table Rock four years later. In the spring of 1886 they went west, coming back to Table Rock after four years, where they remained until the fall of 1898, when they moved to Dorchester, they came back to Table Rock last fall and have made their home here since. The funeral services will be held at the M. E. church at 11 o'clock Friday morning, under the auspices of the Women's Relief Corps, the services being conducted by the pastor, J. T. Roberts. To the bereaved husband and other sorrowing relatives, the Argus extends sympathy. Her aged father, 85, living in Lincoln attended the funeral of his daughter and most of the family are gone, one son and one daughter are left. 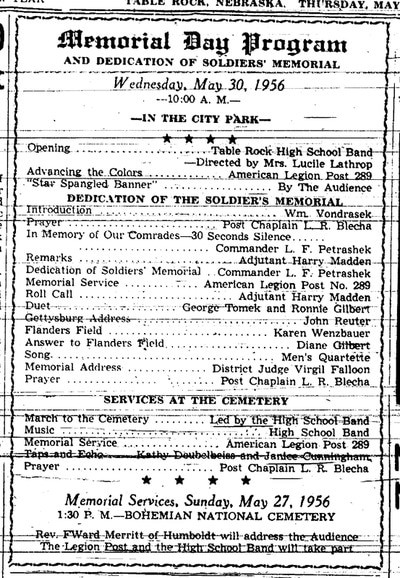 Oscar Fulton also attended the funeral of his brother's wife Mary, from Dorchester, Nebr. The story of sisters split by adoption who kept in touch with each other with the help of caring parents. And there's an epilogue. Sisters Nancy Lee and Nancy Patricia, Photo 4101. Here’s married couple #1, Robert and Lucille Fisher. 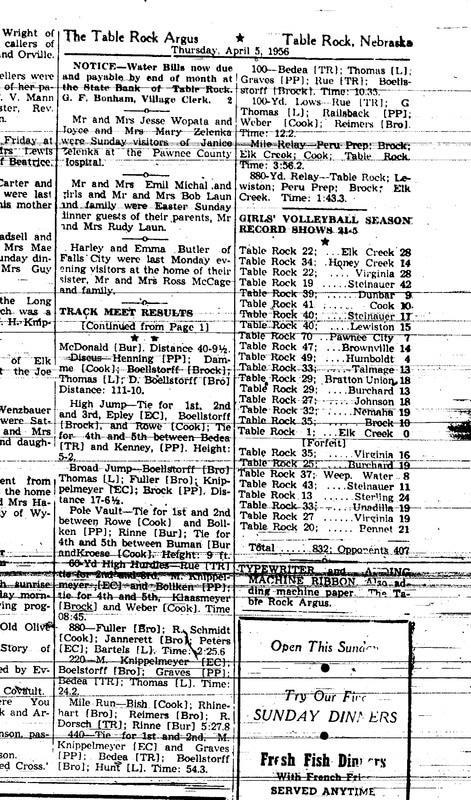 In 1936, Robert and Lucille Fisher had a daughter, Nancy Lee. 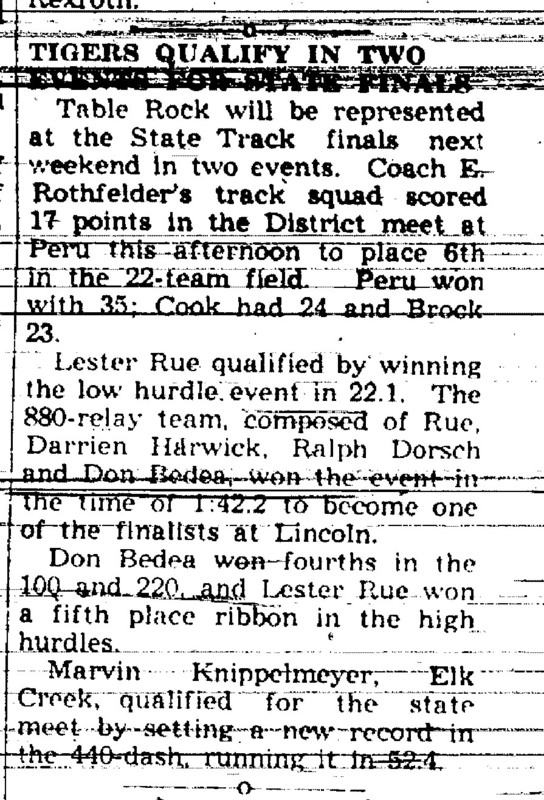 In May 1937, they had another, Patricia Lou. Soon after Patricia’s birth, Robert left her. Lucille was not able to properly care for them. Robert’s sisters took temporary custody, but the State Adoption Agency listed both girls for adoption and were on the way to the Boys and Girls Aid Society. Here’s married couple #2, Elvis and Vina King. In 1936, they had a baby girl who did not survive birth. Elvis named the baby Nancy Lee after his grandmother. Here’s married couple #3, Hugh and Ruby Shepherd McAlpine. This is the Table Rock connection to the story. Ruby grew up in Table Rock. 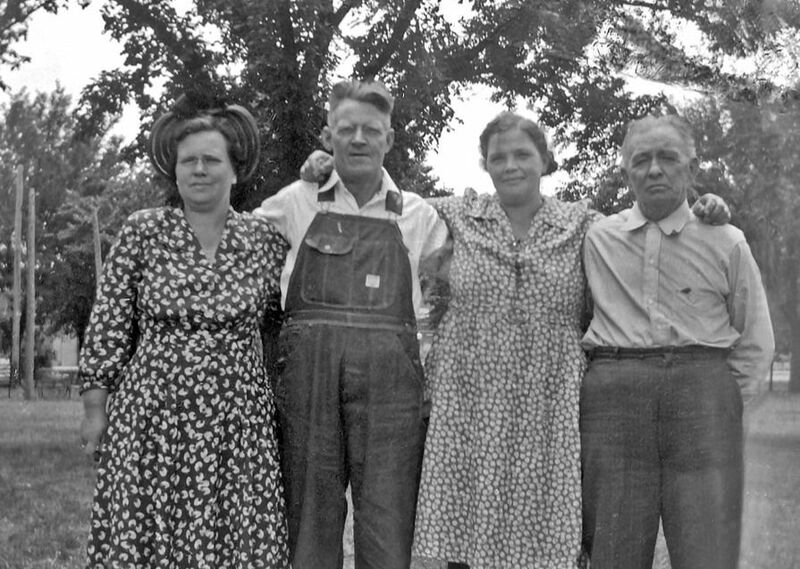 Hugh was a farmer from Seneca, Kansas (about 30 miles south of Table Rock). He was a World War I veteran who had "walked across France." Ruby and Hugh were unhappily childless. Elvis and Vina learned from a friend about the girls. Elvis thought that Vina could only care for one child, and they chose Patricia Lou, who was still a baby. Vina wanted to give Patricia the new name of Nancy Lee, the name of the little girl they had lost of birth, but Elvis would not have that because the sisters would then both be named Nancy Lee. Elvis and Vina compromised on the name Nancy Patricia. Elvis and Vina had became acquainted with Hugh and Ruby who then went to see Nancy. Nancy Lee soon became Nancy Lee McAlpine. Vina at first did not want the girls to know of each other, but again Elvis would have none of that, either. By 1939, both adoptions were final. The King and McAlpine families lived about 30 miles apart and the girls often got to visit each other. 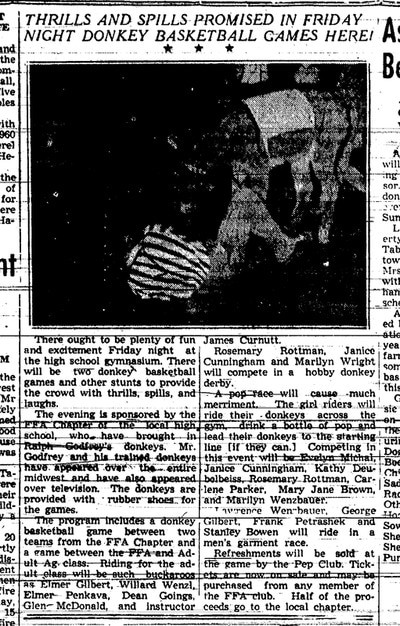 In 1943, Ruby got homesick for Nebraska. They packed up and moved back there. They went to the home of her father, Willims G. Shepherd, who by that time had left Table Rock for Endicott, Nebraska. After the Hotel Murphy burned down in 1931, he had built another, smaller, hotel in its footprint, which he called the Two Way Inn. He had in 1937 traded the Two Way Inn for a farm in Endicott. 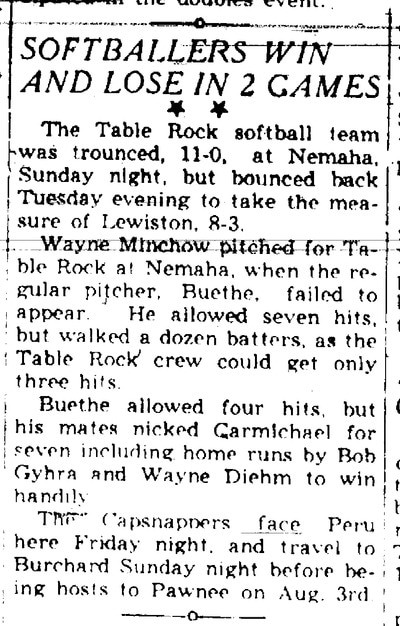 He took off for Endicott, and Slaughter came to Table Rock, where he gave a new name to his new business, the Reno Inn. Months after the McAlpines arrived at Endicott, the farmhouse burned to the ground. Everyone there moved back to Table Rock. Although the McAlpines made many moves after this, Nancy and Nancy stayed in touch with letters. 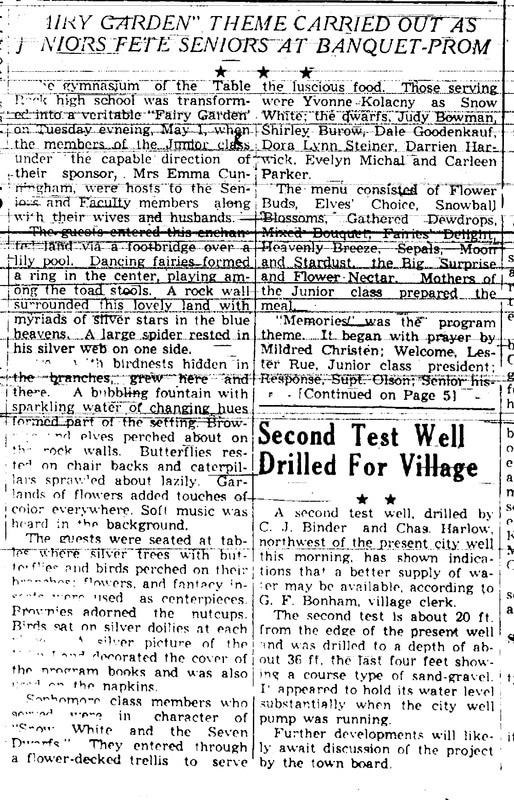 In the summer of 1948, Vina and Nancy Pat traveled from Oregon to Beatrice for the girls’ first visit since the McAlpine’s had left Oregon in 1943. That's when the below photo of the girls on the swings was taken. 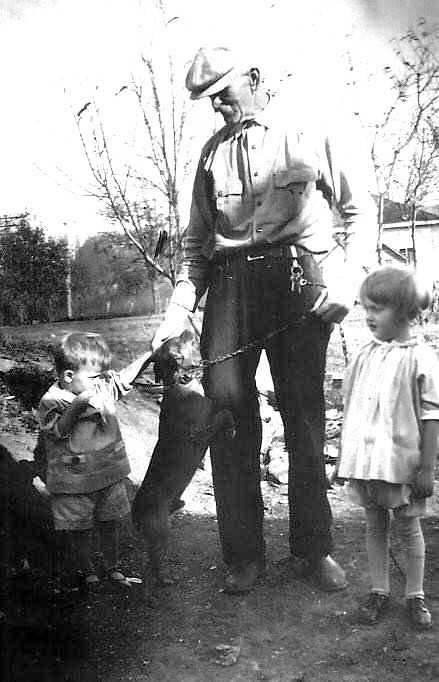 ​On the same occasion, in the photo below, Vina King posed with Hugh and Ruby McAlpine, and Ruby's father W. G. Shepherd. Nancy and Nancy kept in touch with each other by letters. Nancy McAlpine married Ted Quackenbush and made their home in Nebraska and Nancy King married and made her home in Oregon. In 1960, Ted received an Air Force assignment to Portland Air Base. He and Nancy drove to the new assignment. On the way, they stopped in the Oregon town where Nancy King lived. The girls, both with families by then, were together again. During the three years that Ted was stationed in Portland there were many more visits between the two sisters. There was also a journey to the old farm home where Nancy had joined Hugh and Ruby McAlpine to become a family; Nancy gave perfect directions to get there. During their three years at Portland, Nancy also found her biological father, who still lived there. She discovered from him that he had married again and had five more children. Nancy and Nancy had another sister and four brothers. At the end of their three years, Ted returned to civilian life and they moved to California. During the next 32 years he and Nancy took many vacations to Oregon. In 1996, they retired and moved there, just a few miles from Nancy Patricia. Visit between Nancy and Nancy extended to their siblings in Portland. In 2010, Ted and Nancy moved back to California to be near their adult children. In 2011, with lots of help from others and the internet, Nancy learned that her mother had been in California since the 1940s but had died in 2005. However, Nancy discovered that her mother had remarried and had a girl and two boys between 1941 and 1944, and then remarried a third time and had another daughter. The daughter from her mother’s third marriage lived in Huntington Beach, only 100 miles from Nancy’s home. With help from the DNA test provided by Ancestry, Nancy was able to contact her new siblings, living in Atlanta and Spokane, but one brother had passed away. Nancy's first sister has passed as have all but one brother from her dad's other family but with email and phone calls contact is still being made with those remaining. Her father had five more children and her mother four. Nancy and Nancy had a total of nine siblings that, when they posed on the swings in Beatrice in 1948, they had no idea existed. Now, if that isn’t a good story, what is?! 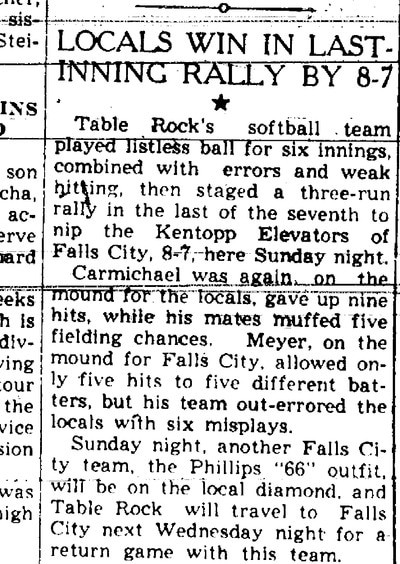 A lovely story about the grandson of Charlie McCourtney and Will Alderman, janitor at the Table Rock school. 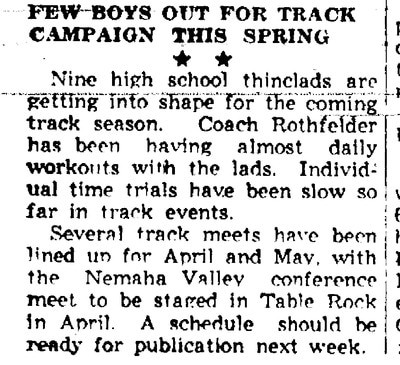 It is from the Table Rock Historical Society newsletter, 2017 #2. A bit flabbergasting, this story about Bessie Penn, Bea Brown's mother! It appeared in the Historical Society newsletter, 2017 #2. This inspiring story came out in the Table Rock Historical Society newsletter, 2017 #2. Dale holding daughter Dawn, undated. Shared by Sharla Sitzman. Dale was 74 when he died in December 2014. 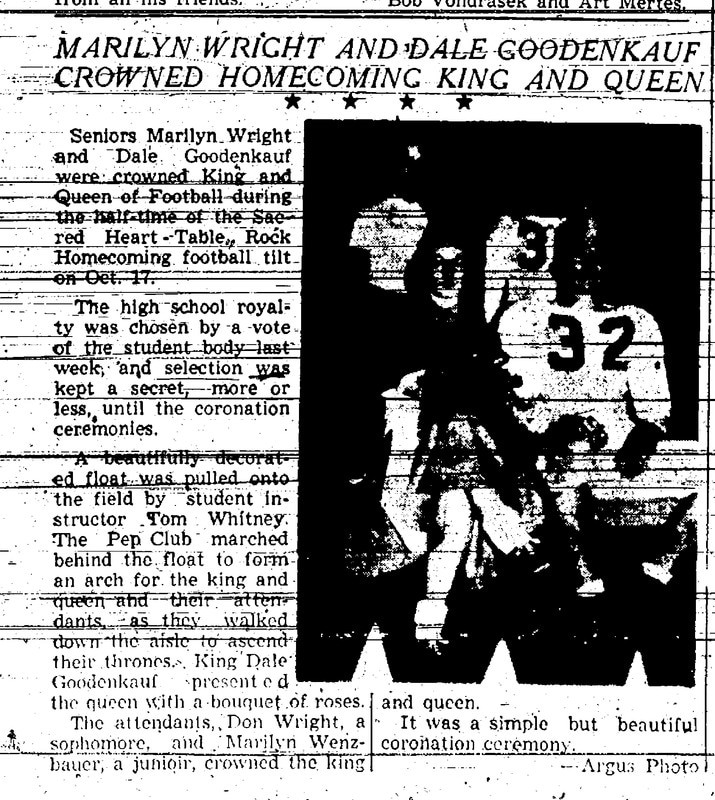 He was born in 1940 to Alfred and Katie (Catherine Schmidt) Goodenkauf of Table Rock. 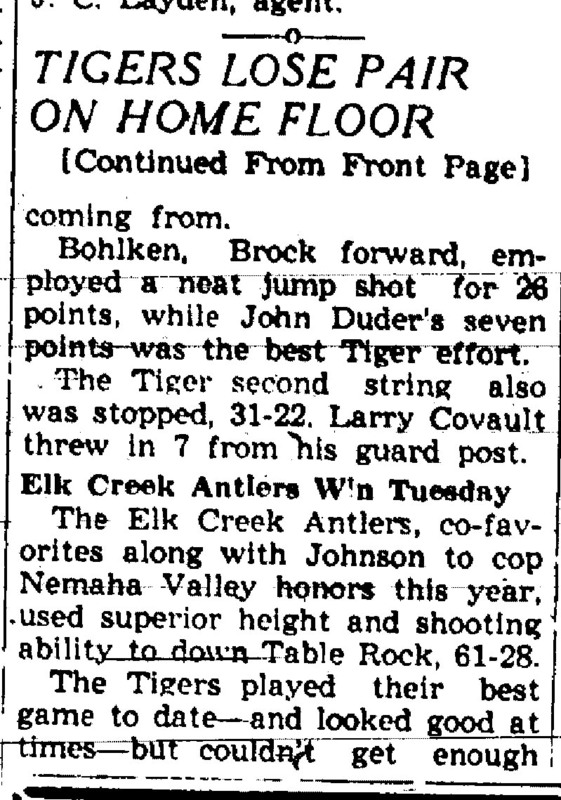 He graduated from Table Rock High School in 1958. 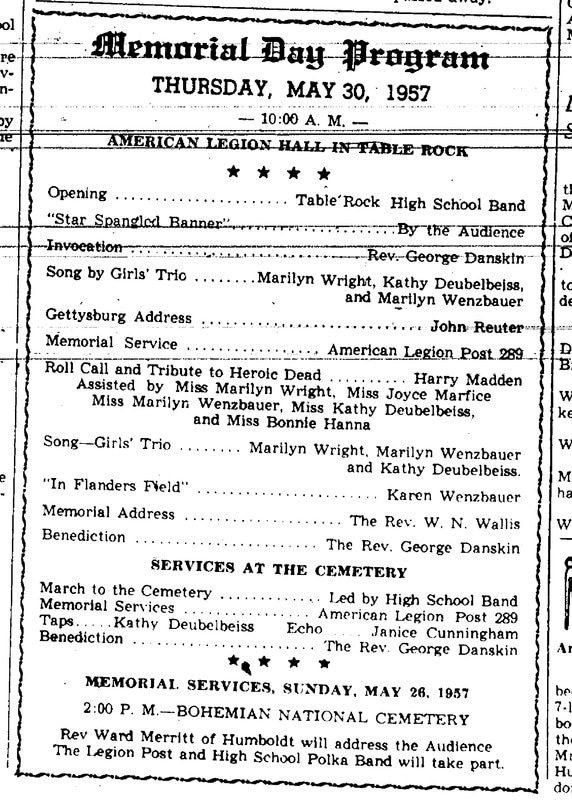 He married Wava Roberts on May 31, 1965, and they had two children, David and Dawn. Dale is well remembered in the sports field. He lettered in all sports for all four years of high school. He excelled in all sports but was especially well known for his football prowess. 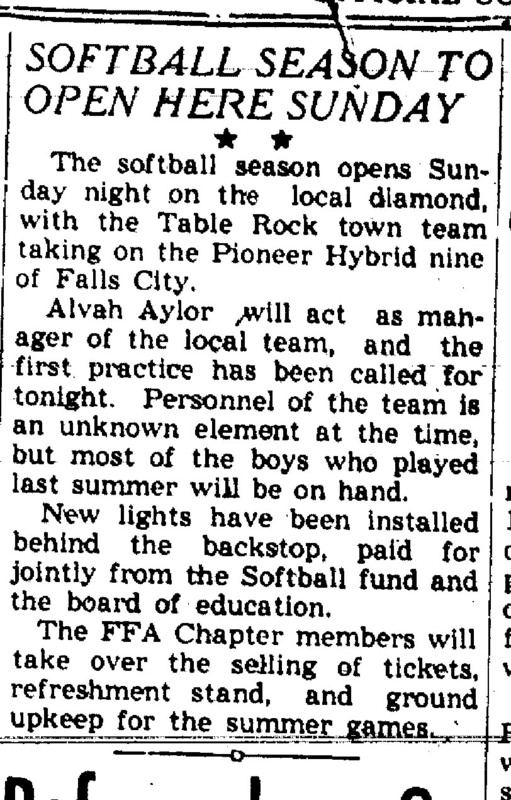 After high school, he played softball locally for many years. During high school, he worked weekends as projectionist at the Table Rock Theater. Over the years, he worked as a heavy equipment operator, mechanic, and electrician. 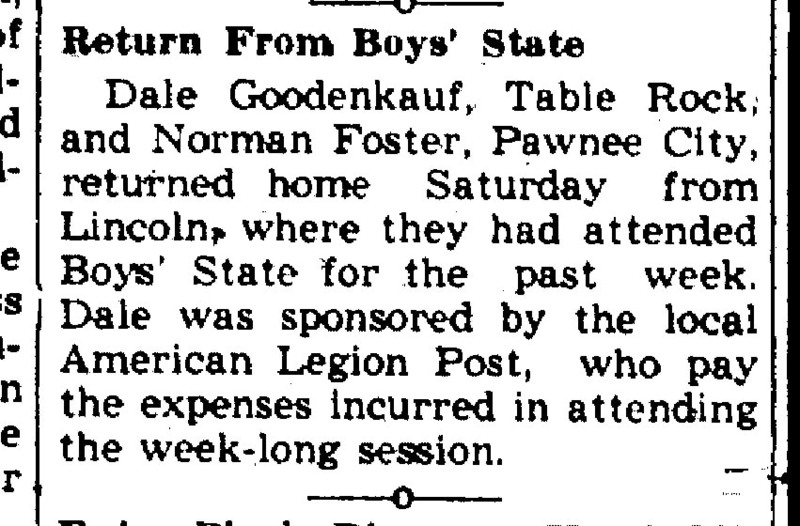 Dale lived in Table Rock most of his life, with some years spent in Pawnee City and Beatrice. Dale was outstanding in football . I played with him and he was our "secret weapon." At that time there were three ways to score an extra point after scoring a touchdown. One was to run it in, which was difficult, another was to place kick it, which was the normal attempt, and the third was to drop kick it over the bar. This is no longer allowed and was very seldom done back then because hardly anyone could do it. It was so difficult that a successful attempt was worth two points as I recall. Dale was deadly accurate when he dropped kicked the ball and won a number of games for us. I faced Dale one time in a softball game. I came to bat 3 times. I saw 9 pitches!! Every pitch was either a swing and miss or a strike. Dale was a gifted auto mechanic, like his father, and usually had an engine hoisted up to a tree while he overhauled it. I think his first car was a 48 Ford that was wrecked when he got it. I helped him change the bent fenders and work on the engine. When we got thru the car had a blue body and black fenders and a flat head V-8 that purred and growled like a new car. 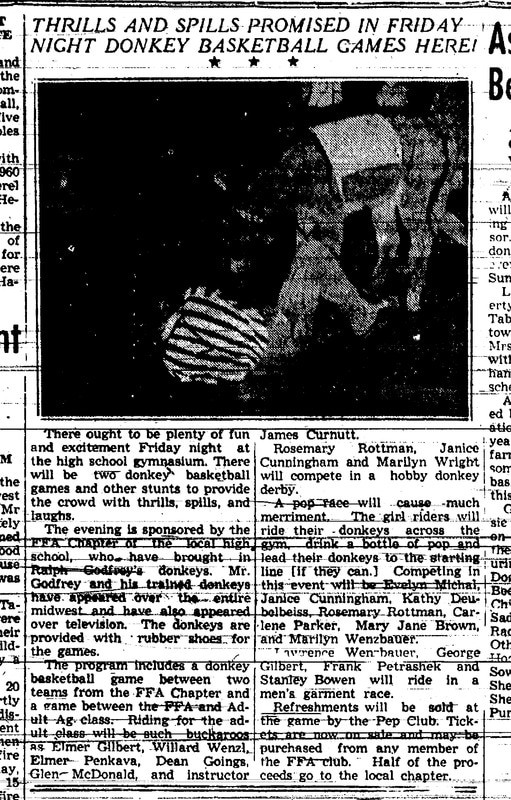 This would have been around 1955. He was a good friend for many years. he broke the law! the pretty girl was picqued. It is sometimes quite costly to tell a young woman how handsome you think she is, and on Saturday night Samuel Shawhan...had a costly experience of the kind. He had bowled up some and was finally arrested and charged with being drunk and disorderly, one of the specifications being that he had insulted a young lady. The judge found him guilty assessed a fine of $5 and costs against him – a total of $13.45, which Shawhan paid. He declared he will never again tell a pretty girl what he thinks of her. Samuel Shawhan married Miss Mary Ellen Bryant on March 14, 1900 and they proceeded to have two children. Was she pretty? Did he lose his resolve and tell her she was pretty and if so, was he fined again? We will never know. That's part of another story. I do know that Sam died young. It was only 10 years after he was fined. He was only 36. I hope those seven years of married life that he had were with a pretty girl and full of joy. 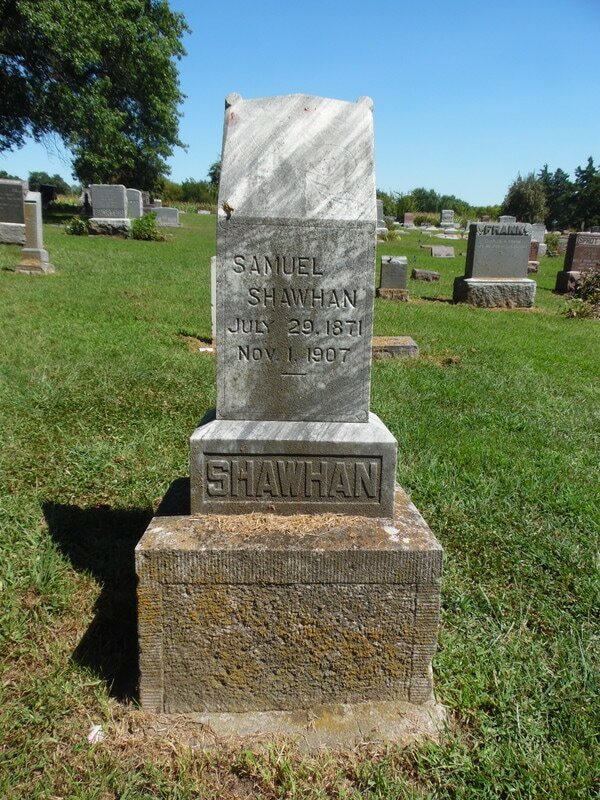 Samuel Shawhan, buried in the Table Rock Cemetery. 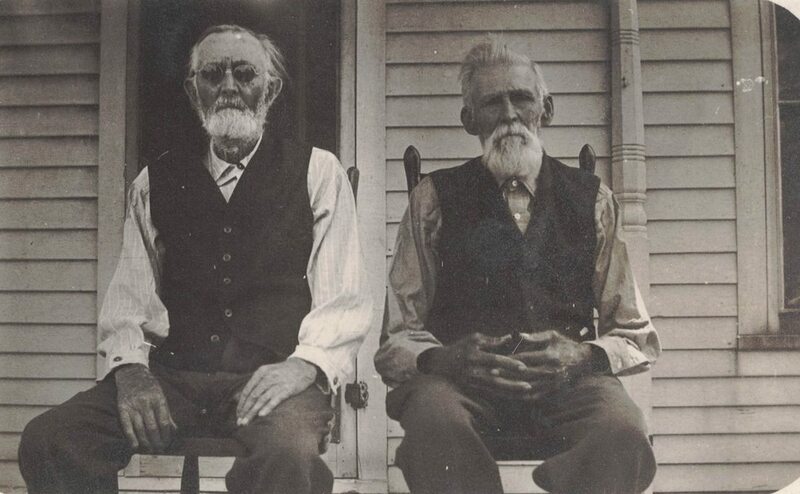 Sam's older brother Edgar, born in 1860 and lived to be 97. Sam was born 1871. Perhaps Sam would have had a resemblance to Edgar had he reached this age. Photo shared by Cindy Ann Shutts on Ancestry. ​A door now in the Pioneer Museum was the jail door in the courthouse. In 1911, the current courthouse replaced the one that was the site of this story; apparently this door was in the 1911 courthouse and removed during renovation at some point. If it had been in the old jail it would have witnessed many events. Of the many dramatic events, the night the vigilantes came for Frederick Emmons is likely the most dramatic. The story begins with the 1888 murder of a young laundress at the Exchange Hotel in Pawnee City by Emmons; she had refused his offer of marriage. It ended with him "committing suicide" at a railroad bridge, at the hands of a lynch mob. Read about it by following the link. Historical Society member Luella Hinrichsen, poring over old editions of the Argus in search of obituaries, came across the sad story of Mike mccourt, a man who "was accentric in the extreme, his brain mechanism was not always working harmoniously." 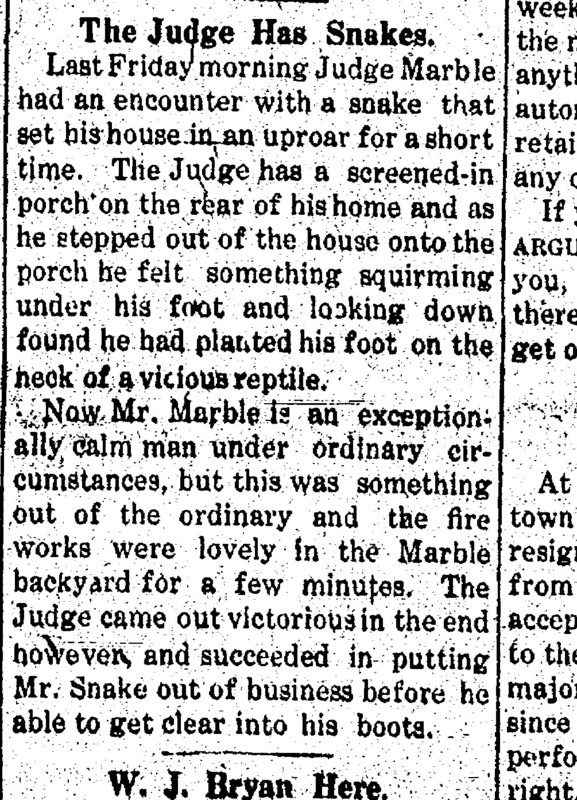 The Argus reported in the September 1, 1904 edition that an effort had been made to find money that McCourt may have hidden at his home. He apparently did have a good amount of the money in the bank, but there were stories of treasure. Many people who were somewhat familiar with the habits of Michael McCourt, who died ten days ago, had an idea that he had money buried somewhere about his premises and the estimated amount of this hidden treasure varied with the individual guesser. On Saturday morning F. A. Harrison, who is executor of the estate under the will, was accompanied by Judge Marble and others repaired to Mike's late residence. With spade and pick, they proceeded to turn over more mother earth than either gentleman had in years before. In hopes of finding the money, they dug in the garden, in the yard under the house, and in ever conceivable place where the treasure might be hid. Finally, in a stove in the house, they found 85 cents, and in the stove pipe 4 cents more. Given how much money he had in the bank, they figured it not likely that he had hidden it at home and the search was abandoned, with 89 cents for their efforts. In the end, Pawnee County probate records reveal that Mr. McCourt left a will, which he had prepared in 1895. He did not leave money to the church. Mr. McCourt had some land and money in the bank, worth several thousand dollars. Of that, he left $10 to each of two sisters, and everything else to his brother Bryan. Bryan still lived in Ireland. 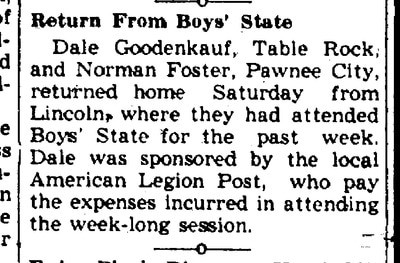 He did not travel to Table Rock but rather appeared through attorneys in New York City, who retained the local Pawnee County firm of Story & Story to represent Bryan's interests. Silas Hays on left and "Mr. Law," a Table Rock contemporary. In 1862, Mr. Hays took a little trip to California. 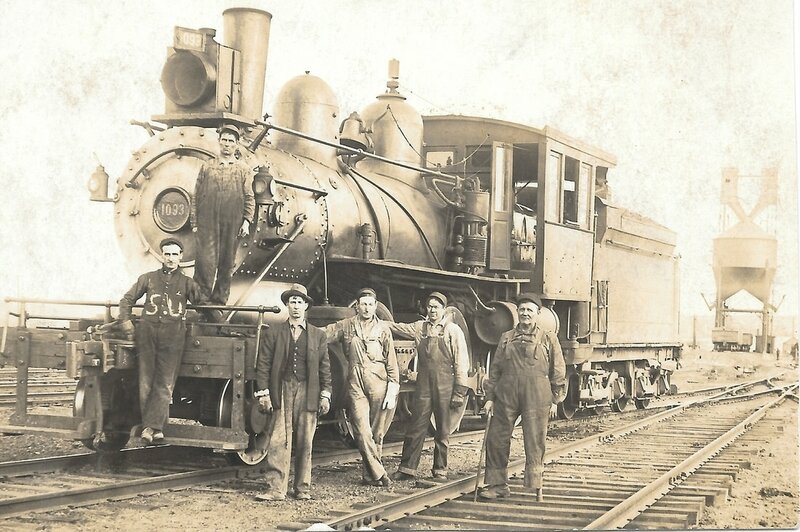 This family photo was shared by Historical Society member Brad Bowen. 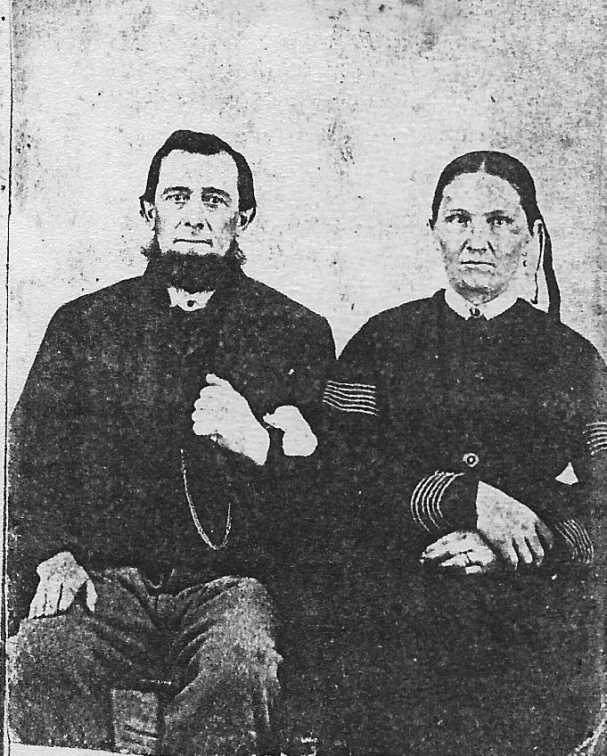 Silas and Elizabeth Hays, 1870, a few years before they came to Table Rock. 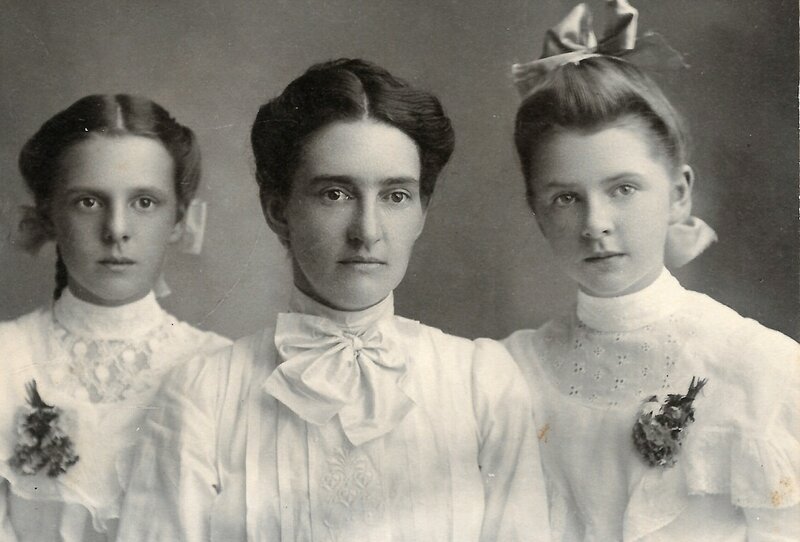 Shared on Ancestry by SherryBerthot65. 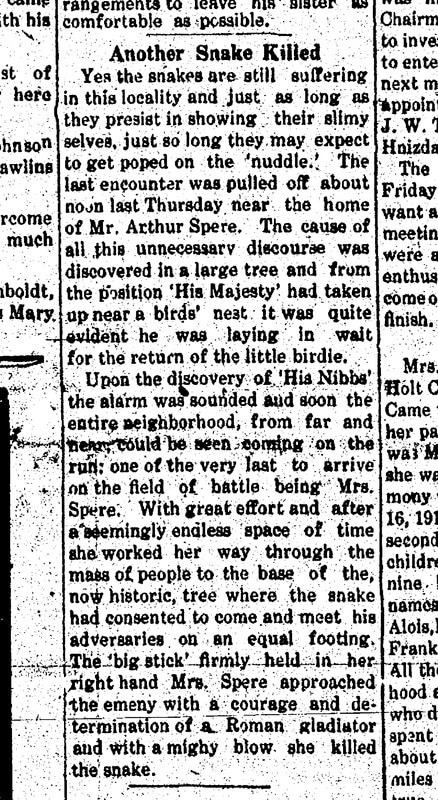 This article was shared on Ancestry but sadly we forgot to note the tree from which it came. 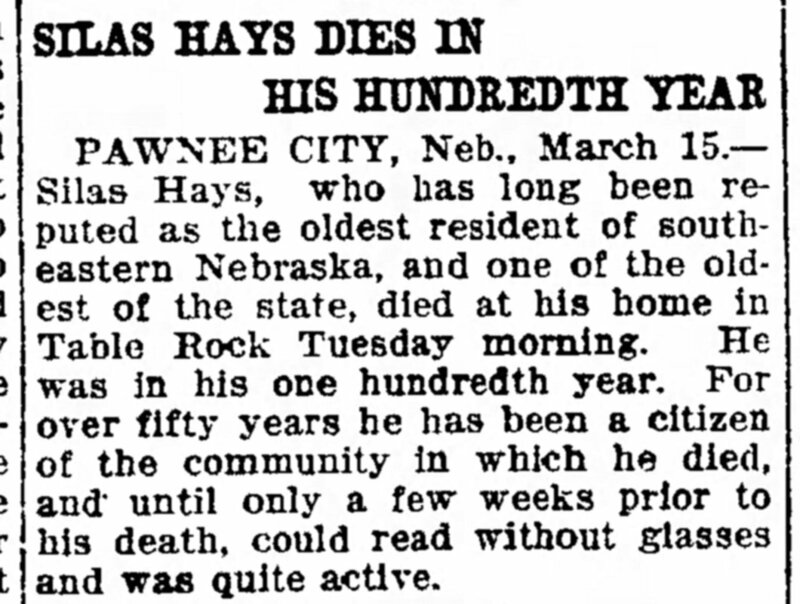 If marks the birthday of Silas Hays of Table Rock. The reference to the Chief is presumably to the Pawnee Chief, an early competitor to the Republican. It tells of Silas Hays' wagon trip to California, Spring of 1862. Historical Society member Luella Hinrichsen, poring over old editions of the Argus in search of obituaries, came across the lovely story about a wedding in 1870. 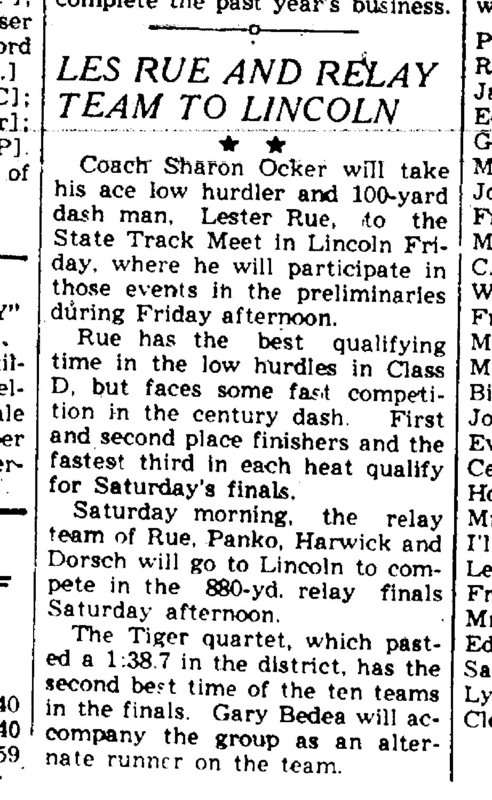 It was in the July 11, 1924 Argus. The story needs no re-writing. Wedded Long, Long Ago- On July 3, 1870 a wedding ceremony was performed which united the loves of two Table Rock young people. So tightly was the knot tied that all the storm and stress of the intervening years have not been able to break it, and the husband and wife are living together today in contented and happy old age in Table Rock. 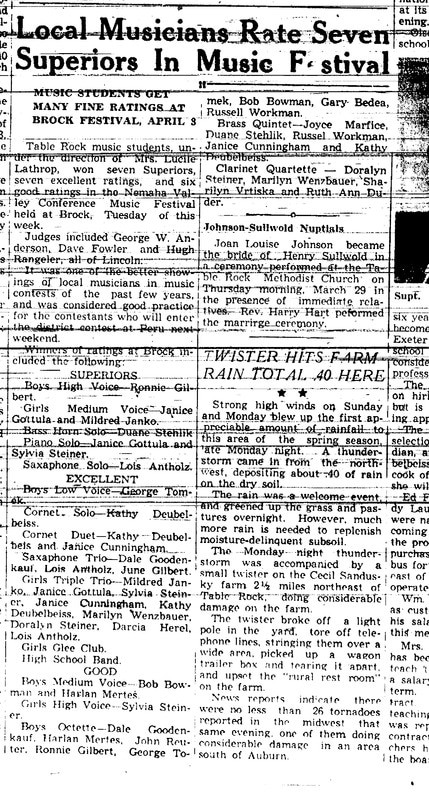 The contracting parties to this wedding of fifty-four years ago were George M. Lane and Miss Clara Cooper, popular young people of this community, and members of prominent pioneer families of the community. They commenced life together on a farm west of Table Rock. For the past quarter of a century or more they have lived in town having retired from the farm. hey realize that time has wrought great changes in conditions in Table Rock and Nebraska, for they have lived through them in the years of their married life, and as they go on down the journey of life hand in hand it is the hope of their many friends that joy and happiness will follow them to the journey's end. George died in 1925 at age 76, Clara in 1931 at age 77. When they married in 1870, George was 21 and Clara 16. 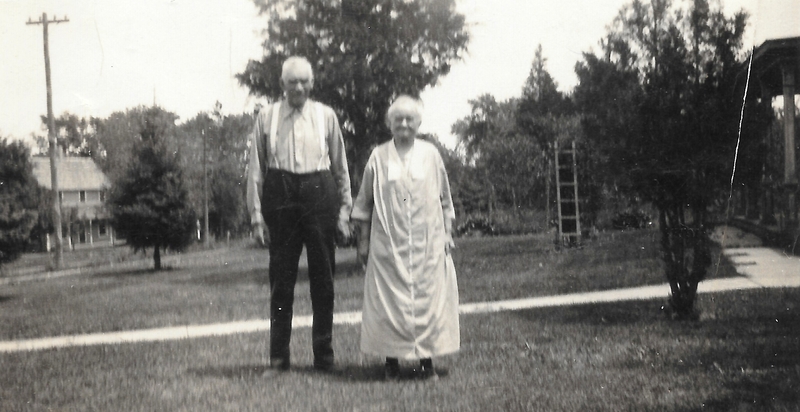 George & Clara, undated, shared by Historical Society member Terry Korrell, photo 1806. 1891 - a wedding picture 1900 - an apology. KIND OF. Anyway, the best revenge is living well, and Della, who never remarried, did that. She raised her two beautiful daughters, Ruth and Stella, to be two beautiful young ladies. Parker missed the boat. Ruth & Stella McCoy, Photo 1836. This is Photo 1837, Della Purcell McCoy with her daughters Ruth and Stella. No Parker in sight, too bad, so sad! I wonder whether he got the prayers he asked for in lieu of criticism? Della was born in 1872 -- she was 19 in her wedding picture. Ruth McCoy Muscheites, who is on the left, was born in 1894. This picture may be circa 1907, with Ruth at 13 and Della at 35. The photographer may have elicited a pensive gaze from each, but it does not look that time has particularly affected Della's loveliness. 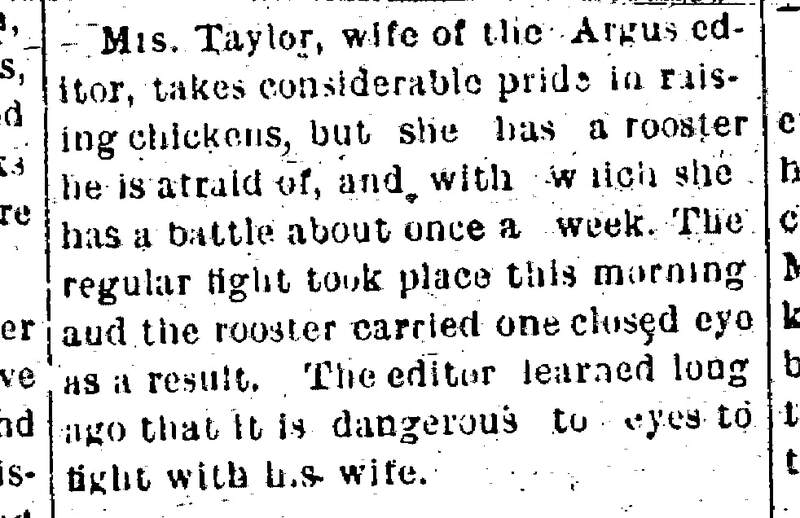 The 1905 Argus article is headlined:: "Mrs. C. S. Wood Passes Away While the Husband is Flying Toward Table Rock at the Rate of a Mile a Minute." Here's the story, as derived from the article, her obituary and his. One day, Charles S. Wood left for Pierre, South Dakota, to buy sheep. The next day his wife -- July 26, 1905 -- Nancy, took sick. She had a fever consistent with typhoid fever; the next day the fever ranged from 99 and one-half to one hundred and one-half. She improved for a few days, giving her friends and family hope, but then her condition seriously deteriorated. A telegram was sent to Mr. Wood telling him to come home. 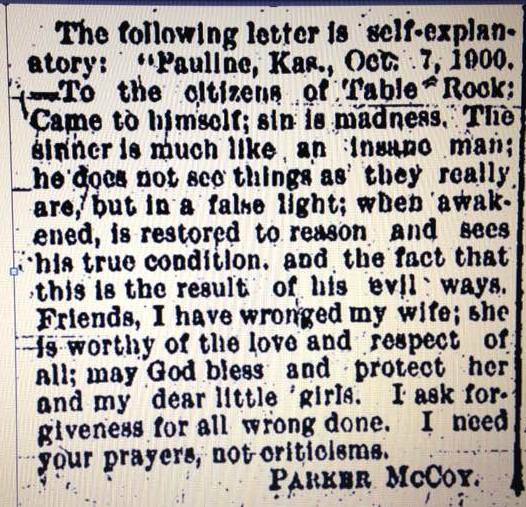 The next day, Table Rock received a reply from Pierre. Wood had gone out to look at some sheep and could not be found. Nancy's condition had become "alarming." 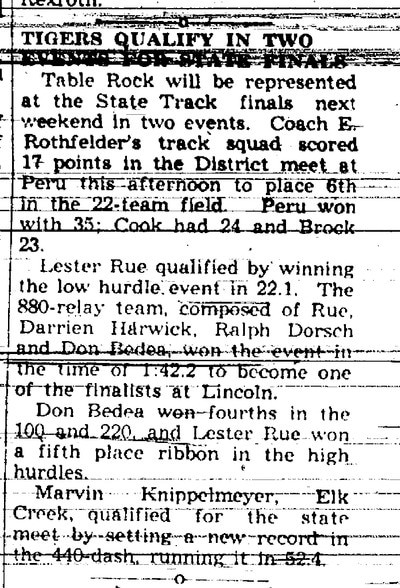 Word was sent to the Pierre telegraph office to send a messenger after Mr. Wood. 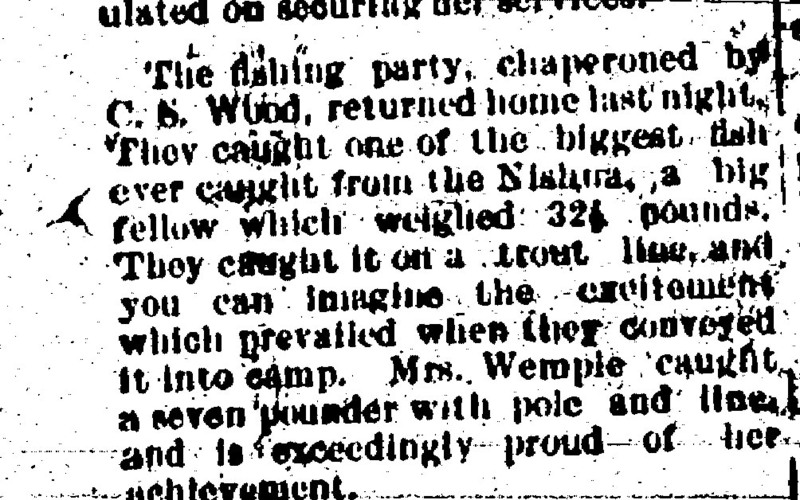 "This was done and for four days the messenger drove over the country seeking Mr. Wood, who with a driver named Brown and a gentleman named McKinney were ninety-five miles from Pierre." The messenger finally found Mr. Wood and his two associates. However, the message had been garbled -- it was said that the wife of the driver, Brown, was dying. The three men took off for Pierre. After driving 20 miles, another report reached them. This time it was the brother of Mr. McKinney, the secondman, who was dying. The three men continued heading for Pierre. They received yet another message: that Mr. Wood's mother was the one who was dying. Mr. Wood did not believe the report. The message said that "mother" was sick, and he realized that it had been sent by his children, not his wife Nancy. The three men continued to head for Pierre post haste. A change of teams was secured and the remaining sixty miles to Pierre was made at the rate of eight miles an hour. At Pierre, Wood got a letter from his daughter saying that Nancy was better. The letter was not dated and in fact had been written before Nancy's turn for the worse. However, Wood took enough comfort from it to get some sleep. He was exhausted from the long drive and worry. As Wood slept, the Table Rock people were desperately trying to reach him. Another message had been sent telling of Nancy's deterioration to an alarming condition but Wood could not be found. 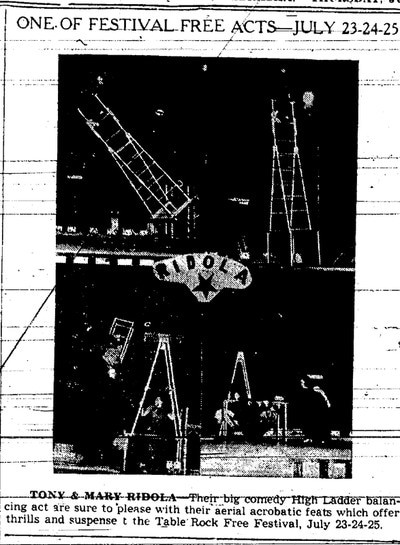 Finally, the Table Rock people thought to contact the Masonic Lodge, and the order helped locate Wood and get him the message. 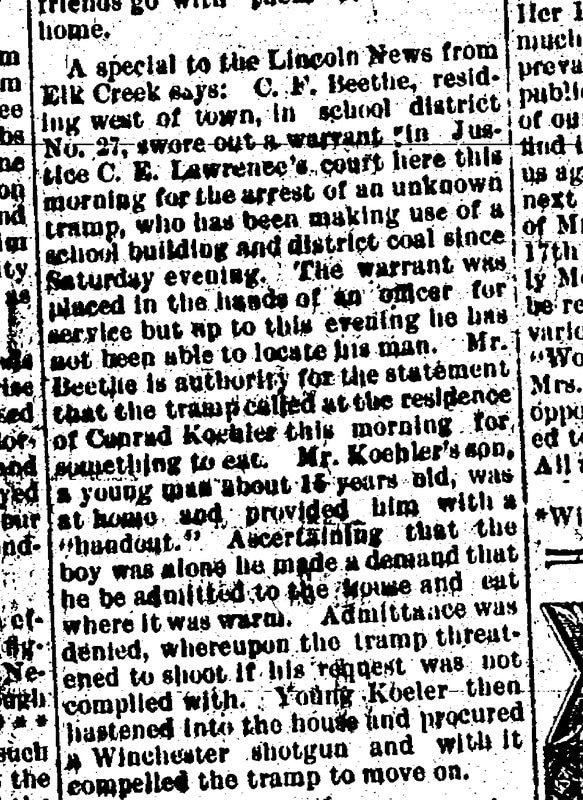 His friend C. H. Barnard of Table Rock had been in Lincoln and was sent a telegram begging him to meet Wood at Council Bluffs and to "use every means to hurry." ​Barnard told Wood of Nancy's condition and got him on Train Number 13 of the Burlington & Missouri Railroad from Burlington to Lincoln. At Lincoln, a special train to Table Rock was arranged to speed Wood on the way to his dying wife. This train was in charge of Conductor K. E. Cleaveland and Engineer Mike Lewis, both well known to Table Rock people. The train "made wonderful time, going so fast that the only lights maintained were those inside the coach." 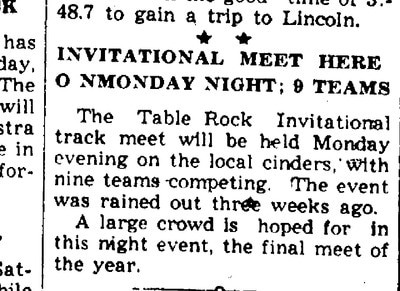 Spurred by the news that his wife was dying C. S. Wood of Table Rock last night made the race of his life to reach her bedside before the end came. For twelve days the woman has hovered between life and death, and the husband was absent, with whereabouts unknown to the relatives at home. After many fruitless attempts he was finally located at Pierre, S.D. and the start began. ​When word was received that he was coming, the physicians made use of the strongest stimulants to keep Mrs. Wood alive until he could reach her. The most sensational part of the trip from Pierre was from Lincoln to Table Rock. Mr. Wood arriving in Lincoln on Burlington train No 13 from Omaha at 12:52. In just three minutes, he was speeding in a "special" train to the south with orders for a clear track and unlimited speed. 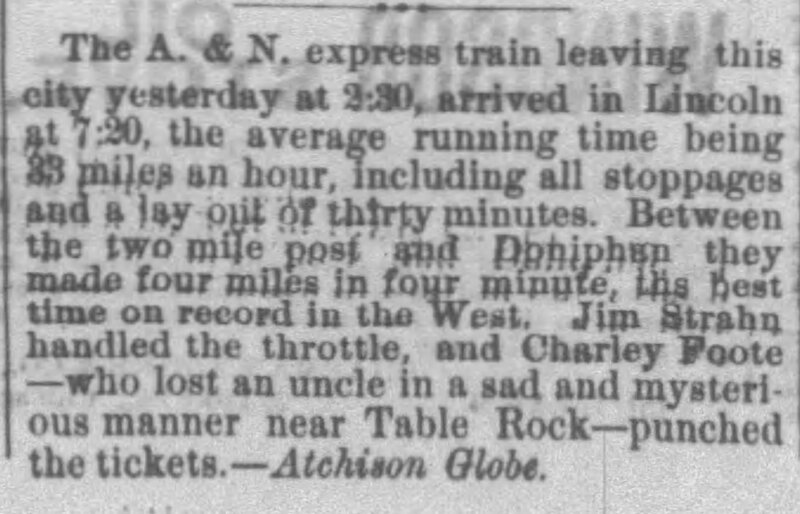 The distance from Lincoln to Table Rock is sixty-three and a half miles, and this stretch was covered in exactly sixty five minutes, including a delay of five minutes wait for the train from Kansas City. A rate of better than a mile a minute was maintained for the entire distance. "We wanted to have the train ready for starting within a minute after No. 13 arrived," said Chief Dispatcher Mullen this morning, "but there was a delay in the - office of two minutes. 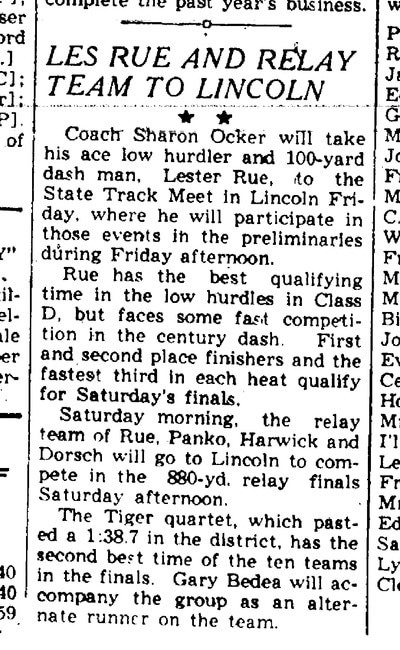 The delay was aggravating and it seemed an age to the anxious husband, but the rest of the way was covered in record time." 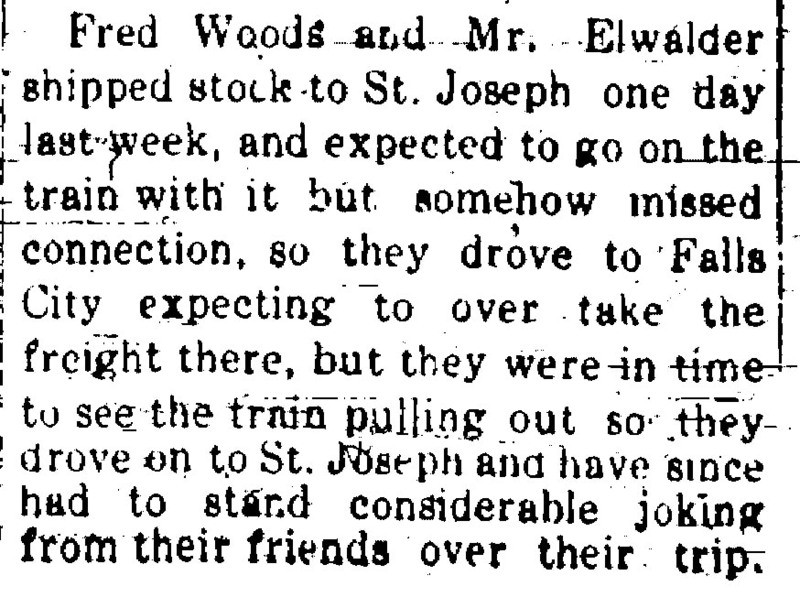 The efforts of Mr. Wood and trainmen were in vain. An hour before the husband arrived Mrs. Wood died. 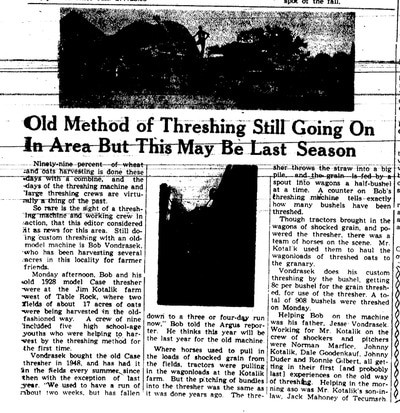 The Argus reported that while the search for Wood was on and while Wood was desperately trying to get to Table Rock as soon as possible, "everything was being done for the sufferer. Dr. Wilson had Dr. Anderson of Pawnee City and Dr. Wallace of St. Joseph to consultation; a trained nurse had been secured from Pawnee City and on Monday Miss Higgins, and a trained typhoid nurse from St. Joseph arrived. Nevertheless, Nancy lapsed into unconsciousness and died nearly an hour before Wood's train arrived at the Table Rock depot. "Throughout her sickness up to the time she lost consciousness, she was cheerful and hopeful and thought she was getting better." "The anguish of Mr. Wood on learning that after all, he was too late to see his wife alive, we will not attempt to describe, but the sadness of it all touches every heart in the community." They had been married since 1867, she having been 19 years old at the time. They had three children together, Charles, Elmer, and Emma. 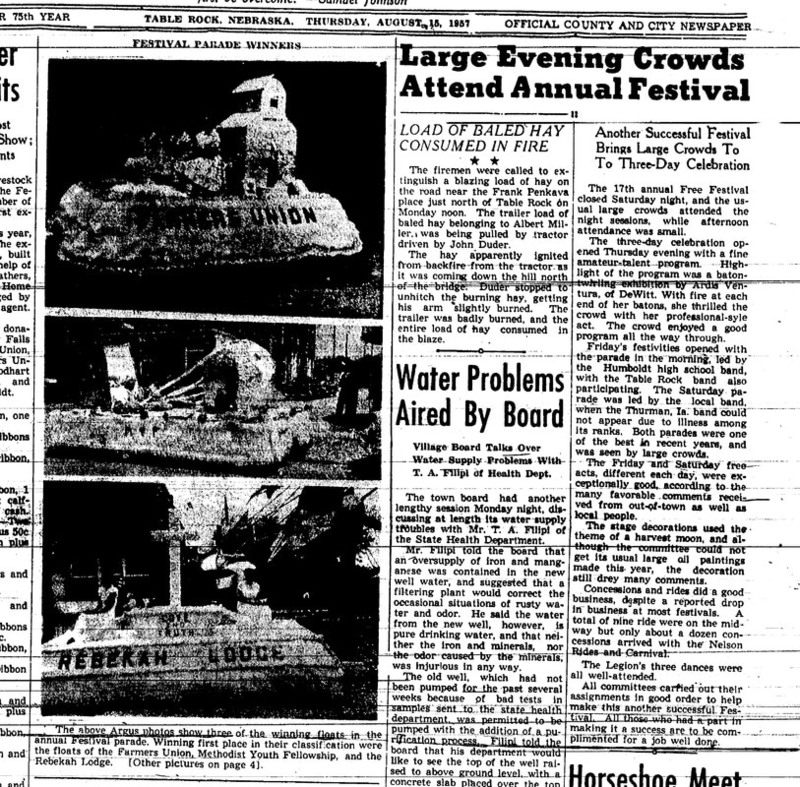 The family came to Table Rock in 1874. "No person more fully possessed the universal admiration and esteem of our people than did Mrs. Wood and her death under the sad circumstances intensifies the feelings of sorrow throughout the entire community." The Methodist church was filled "to its utmost capacity by those who desired to pay a last tribute of respect to the memory of one who in life the esteemed so highly." She was buried in the Table Rock Cemetery. 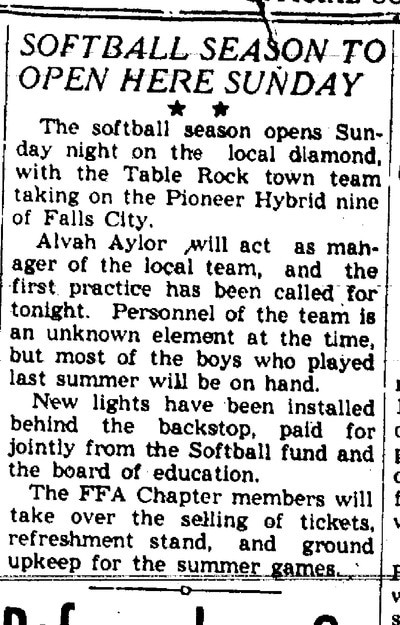 Here is the story as it appeared in the 2017/#4 edition of the newsletter of the Table Rock Historical Society. It describes the efforts of Wood's friends like C. H. Barnard and a heroic train crew that included K. E. Cleaveland of Table Rock. And it tells the story of the final days of Charlie's wife Nancy Wood, dying of typhoid fever. 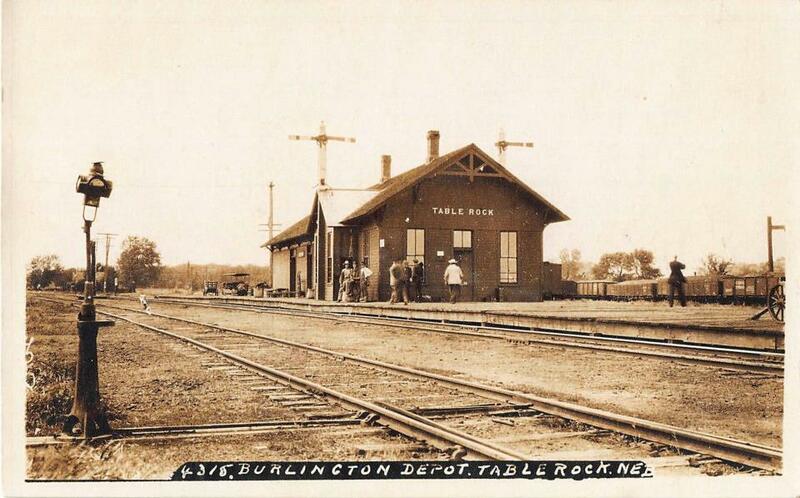 Below: ​The Table Rock depot where Wood's train arrived an hour too late for him to see his wife before she died. 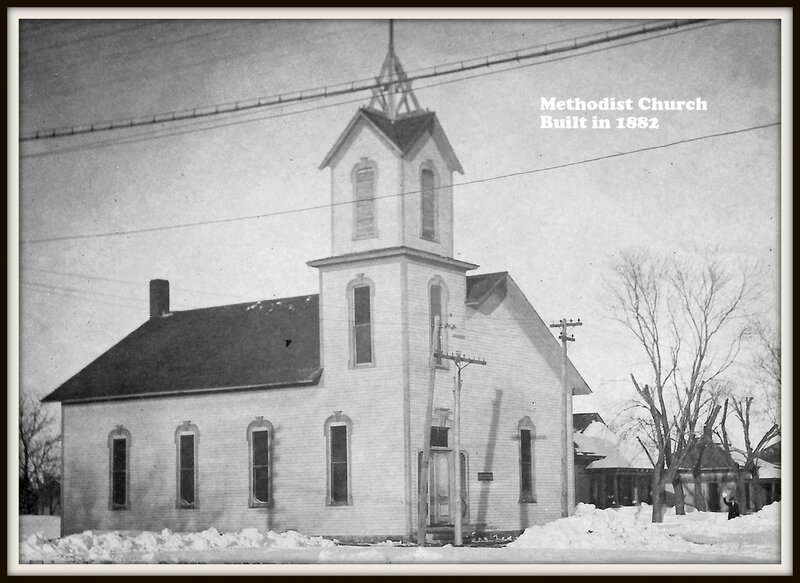 The Methodist Church as it was in 1905. The Methodist Church as it was in 1905, when Nancy's funeral was conducted there. A train at the Table Rock depot, undated. Perhaps it was a train like this that went at the fantastic speed of a mile a minute. Photo 1865. Conductor K. E. Cleaveland was on Train No. 13. 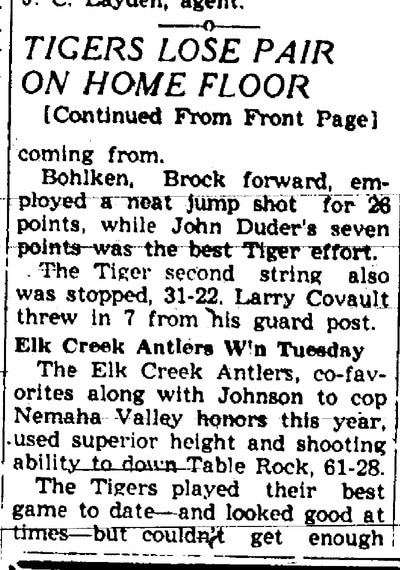 He lived in Table Rock. His sons Art and Howard had fought in Manila in the Spanish-American War in 1898. His won "R. A." graduated from Table Rock in 1899. Conductor Cleaveland's son Howard became a railroad brakeman, and in 1903 suffered a catastrophic back injury. The article here gives a good prognosis, but it was not to be. Howard was never to walk again. 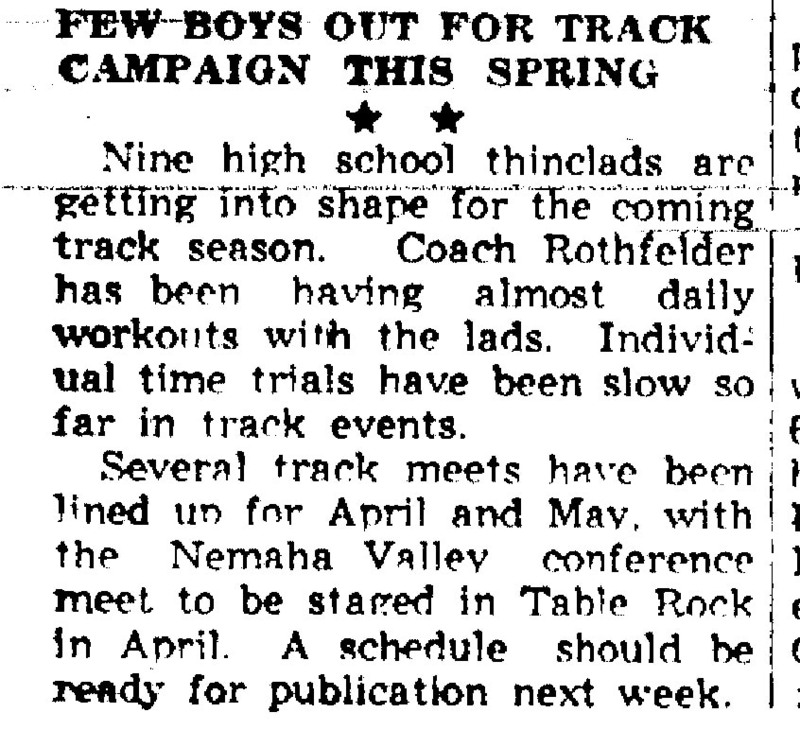 It was two years after his son's accident that K. E. Cleaveland's train speed toward Table Rock. Jim McCurry, a fallen soldier of the Phillipine-American War, a man who left a fiance in Table Rock, a bright intelligent girl who took the news hard, and a couple of cousins.